When your blood sugar levels drop too low (a medical condition known as hypoglycemia), you typically feel hungry, shaky, weak, and confused—it’s definitely not the most productive way to start any day. Hypoglycemia isn’t a disease, but it is a health condition that needs to be monitored and treated accordingly. Ironically, type-1 or type-2 diabetes patients who regularly take insulin injections to control or lower their blood sugar levels can end up with hypoglycemia as a result. Diabetes patients take insulin to correct their blood glucose levels. But if you take more insulin relative to the proper amount of glucose found in your bloodstream, this can result in a sharp decrease in blood sugar. 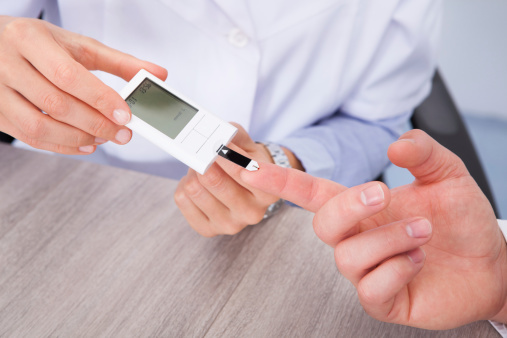 Let’s take a closer look at the relationship between hypoglycemia and diabetes. Hypoglycemia is caused by the side effects of drugs that are used for diabetes treatment. However, it might actually help to understand how hypoglycemia occurs, which means you will first need to know how your body regulates blood sugar production. During the digestion process, your body will break down all the carbohydrates from different types of foods. Most of these foods will contain glucose, which is the main energy source for your body. After you eat, glucose is absorbed into your bloodstream; however, in order for it to enter the cells, it will need help from insulin. When blood glucose levels rise, it will signal specific cells in the pancreas to release the necessary insulin to lower blood sugar. The insulin will unlock the cells and then allow the glucose to enter and provide the nutrients that the cells need to function. With hypoglycemia, the blood sugar levels rise at a significant rate, which triggers the body to release even more insulin very rapidly. This causes the body to react quickly and eventually crash, because too much insulin was released. 1. Medications: Accidentally taking someone’s oral diabetes medication can lead to hypoglycemia. 2. Excessive alcohol consumption: If you drink heavily and don’t eat, you’re blocking your liver from releasing stored glucose into the bloodstream, which can lead to hypoglycemia. 3. Critical illness: Some diseases related to the kidney and liver have been known to cause hypoglycemia. Kidney disorders can prevent your body from releasing the medications you are taking for the disorder. A buildup from the medications can affect your glucose levels. 4. Hormone deficiencies: Specific disorders to the adrenal glands and the pituitary gland can result in a deficiency of several key hormones that regulate glucose production. This disorder tends to occur more with children than it does with adults. It is imperative for diabetes patients to know how to recognize and treat hypoglycemia. The best thing for the patient to do first is take a glucose test. If it reads 70 milligrams per deciliter (mg/dl) or lower, it can lead to insulin shock if not treated right away. The patient should consume 15 to 20 grams of carbohydrates or take three to four glucose tablets. After doing this, they should wait 15 minutes and take the test again to make sure that the glucose levels have returned to normal. If it’s still low, repeat the process. In situations where hypoglycemia has become severe, it may be beneficial to have a Glucagon kit on hand—it’s an emergency injection kit that you can use if you become hypoglycemic and are unable to take sugar, carbohydrates, or glucose pills orally. In the past, patients who were diagnosed with hypoglycemia were usually prescribed sugar-restricted, high-protein diets by doctors. That treatment can actually impair a person’s glucose tolerance level, because the protein that is recommended is typically high in fat, which will contribute to the development of diabetes, along with other severe health problems. Let’s take a further look at what type of diet is acceptable for hypoglycemia patients. You can treat hypoglycemia with certain medications, but a natural way to keep it under control is through a healthy diet that is similarly used to control diabetes. That diet includes reducing simple sugars, large intakes of complex carbohydrates, and frequent meals. Candies, sodas, and even some fruits are very high in sugar and should be avoided. Breakfast: Eat one cup of hot, whole grain cereal; this could be oatmeal or oat bran. Have one slice of whole grain bread and one piece of low-sugar fruit of your choice. Snack: Eat one piece of whole grain bread and a single serving of carrot or celery. Lunch: Eat a salad with raw vegetables, beans, sunflower seeds, and any non-fat, dairy-free dressing. Add one piece of whole grain bread and one piece of low-sugar fruit of your choice. Snack: Eat four crackers (whole wheat is recommended) and one piece of low-sugar fruit. Dinner: Eat one cup of brown rice, pasta, bulgur, or one large baked potato. Have a half-cup of beans or tofu and one to two cups of cooked vegetables. Post-Dinner Snack: Eat two cups of plain popcorn and one piece of fruit. Fowler, M.J., “Hypoglycemia,” Clinical Diabetes 2008; 26(4); doi: 10.2337/diaclin.26.4.170. “Hypoglycemia and Diet,” The Physicians Committee for Responsible Medicine web site; http://www.pcrm.org/health/health-topics/hypoglycemia-and-diet, last accessed May 7, 2015. “Hypoglycemia,” Mayo Clinic web site, January 20, 2015; http://www.mayoclinic.org/diseases-conditions/hypoglycemia/basics/causes/con-20021103.